i have a rugger special is it the same thing as fourtrak?? will the parts of the fourtrak fit mine? it looks different. mine looks bigger ,taller? "The Daihatsu Rugger was an off-road vehicle built by Daihatsu between 1984 and 2002. 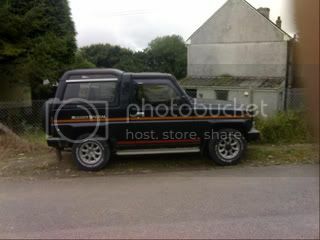 The Rugger was called the Daihatsu Rocky in most export markets, and Daihatsu Fourtrak in the UK." I'm not sure about the special. BTW Mine looks taller (2" or 3") since having the rear leaf springs replaced! I belive it to be exactly the same car. The Rugger was the Australian name for the 4trak. Rugger special just has some different trim and accessories to other ruggers/rockys/fourtraks! You get that little bar on the front for spots, some have sportier stripes,some ive seen had little curtains in the back! Might have air cond as well. My old Rugger was a top of the range Prior!! Had air cond and auto hubs as extras. Didnt think theres any major differences. Does yours have a removable sunroof? No Ruggers in NZ were only used imports from Japan. All new vehicles were sold as "Rocky" (NZ/Australia). Sorry Kev, not right. Daihatsu never sold a Rugger in Oz. The particular vehicle were sold at Rockys in OZ. They were sold as Ruggers in New Zealand, and South Africa. They are the same vehicles at the UK Fourtraks. I believe they were also sold as Tafts in some parts of SE Asia. I also believe there was a LWB all steel roof version. They are essentially the same, but there may be local market differences, add into the equation that previous owners may have modified it, and this may explain certain things. Asian and African market vehicles sat on higher suspension, this is for their terrain, and the fact they did not have to comply with rollover standards applied in European and American markets. Different wheels were available, most were six stud, some had an optional heavy eight stud wheel set fitted. Toyota production engines, detuned for lower power and enhanced torque. Emissions standards varied depending upon market. Cooler climates had twin batteries fitted, one ran a tank heater and a trickle pump to continuously drip feed the fuel through the system and back to tank, this kept the lines warmer. Sorry to contradict you all! Rugger is the name of the japanese domestic product. Rocky is the name for an Australian AND New Zealand product sold new. There are however many Ruggers in NZ and possibly Australia that are second hand imports from Japan. Rugger is basically identical to Rocky and Fourtrak. Only differances is that rugger has vertical mirrors same as fourtrak, rocky has horizontal mirrors. Rugger has rear lights in back panel, the others have them in rear bumper. Fourtraks have rear fogs, others dont.All the mechanical stuff is pretty much the same. I had put fourtrak parts in my old rugger and fitted/worked fine. I have had rocky/rugger parts put in my present fourtrak and as above works fine. Think there are some minor trim differences as well. You have not contradicted anyone, simply reinforced the various market differences between models and sales territories. it has a sunroof not tryed taking it of yet.so it should be a cambelt on it then?? ?